The SPEC MIX® Split Silo system is designed with two compartments to offer the contractor the versatility of multiple product delivery to a single mixer. Its unique design works perfectly on jobsites where more than one product is needed. The Split Silo houses five bulk bags of two different products in one silo. This silo system’s compact design also makes it a good fit on tight jobsites. Only one mixer is required, making the contractor’s equipment more efficient. 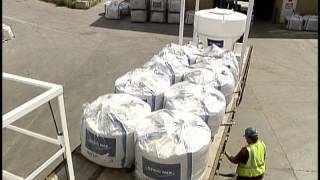 With the SPEC MIX system, every raw material is factory preblended, packaged in heavy-duty bulk bags and dispensed into the Split Silo on site. There is no sand to shovel or pallets of bags to lift, break and discard. If the project requires masonry mortar, grout, concrete, shotcrete or stucco, the Split Silo system will produce the product quickly and consistently to increase profits while decreasing a contractor’s labor and product liability.